Is the Rule of Law Immoral (Part III)? FRONT ROYAL, VA — Last week the Rubble talked to Congressman Steve King (R-Iowa), a prominent member of the House Subcommittee on Immigration and Border Security. Rep. King disagrees with Los Angeles Archbishop José Gomez, who, we noted earlier, advocates amnesty for illegal aliens in the name of the U.S. Catholic Bishops Conference (USCCB). Abp. Gomez picked up the standard left by his predecessor, Roger Cardinal Mahony, who routinely spoke to Hispanic rallies and condemned opponents of amnesty — among them millions of Catholics — for "fanning the flames of intolerance, xenophobia and, at times, bigotry." While the Cardinal's language is unfortunate, such disagreement is hardly unique. A USCCB committee chairman has been criticizing the budget proposed by Rep. Paul Ryan (R- Wis.) for a couple of years now. Before that, the USCCB was a lead advocate for the adoption of national health care — in fact, Obamacare would never would have passed without the bishops' critical support early on. When they finally discovered that the law was a dagger aimed at the heart of Catholic moral teaching, it was too late. With its passage, Obamacare poses one of the greatest challenges to the Church's religious liberty in American history. ...why have the Catholic bishops so consistently championed the political agenda of the left, over the course of so many years? This tradition of frequently errant advocacy gives rise to a question on the minds of many Americans, and not only Catholics: why have the Catholic bishops so consistently championed the political agenda of the left, over the course of so many years? Ironically, the sole exception is the life issues — those moral teachings which the bishops haven't taught since the mid-1960s, according to USCCB President Timothy Cardinal Dolan. One cause might lie in the culture of today's hierarchy: after all, a generous majority of today's American bishops – men of my own generation — probably grew up in diehard Catholic Democrat families like I did. When they were young, abortion was not an issue for either party: it was condemned almost universally. Their party loyalty was tough, surviving even the Democrats' strident opposition to landmark civil rights legislation. Through the years, the affinity continued to grow despite the Democrats' increasingly radical pioneering of abortion on demand as the party's primary social goal. All along, individually and through the USCCB's sizable Washington bureaucracy, the bishops routinely incorporated the Democrats' political agenda into their version of Catholic "morality," espoused in a steady stream of political manifestos published in the name of the Catholic Church. Cardinal Dolan has indeed lamented that the Church's teaching on sexual morality found few champions among American bishops in the years since the 1960s. However, that was not the only Church teaching that fell into desuetude after the Second Vatican Council. In spite of the Council's call for a vigorous laity responding with enthusiasm to its vocation to serve God in the modern world, many bishops continued to embrace the age-old practice of clericalism. What is clericalism? "Clericalism assumes that clerics not only are but are also meant to be the active, dominant elite in the Church, and laymen the passive, subservient mass," writes Russell Shaw, who was for years the Secretary of Public Affairs for the U.S. bishops' conference. To be sure, Vatican II sounded a trumpet call for the "Age of the Laity" — yet the bishops and their bureaucracies have continued to drown out the voice of the laity in precisely those areas where the laity have professional experience and expertise, and the bishops do not. As a result, "the clericalist mindset does fundamentally distort, disrupt, and poison the Christian lives of members of the Church, clergy and laity alike," Shaw writes. One might observe that clericalism has wrought similar damage to American public life as well. Brilliantly and at length, Shaw dissects the "mentality of clerical elitism," an attitude that dismisses the laity with the back of the hand: the laity should "Pray, pay, and obey," as Catholic shorthand has summarized it over the years. Regarding specific issues like immigration, health care, and the budget, Shaw observes that "this proliferation of sociopolitical judgments of a very specific nature is an expression of clericalism." And the door swings only one way. Catholics in public life tend to fall into one of two groups: Group One agrees with the bishops on the welfare state but disagrees with the Church's teaching on human life, and thus supports abortion rights, Obamacare's Contraception Mandate, and similar initiatives of what Blessed John Paul II called the "Culture of Death." Group Two agrees with the Church's teaching on human life but disagrees with the bishops on the welfare state. ...the bishops routinely incorporated the Democrats' political agenda into their version of Catholic "morality," espoused in a steady stream of political manifestos published in the name of the Catholic Church. Catholics are free to differ on the welfare state, but not on abortion. Yet, Catholics in Group Two get hammered by the bishops, while those in Group One get a free pass. A curious dialectic is at work. Consider: Bishop Stephen Blaire leads the USCCB's attack on Rep. Ryan's budget, calling it immoral and unjust. Meanwhile, Bishop Blaire is silent regarding the radical pro-abortion voting records of the two Catholics who represent his California district in Congress. While the good bishop repeatedly and publicly attacks Congressman Ryan, who is two time zones away, neither his spokeswoman nor the offices of the bishop's two congressmen can provide the Rubble with even one instance in which the bishop has publicly reproved either of these Catholic Democrats for their pro-abortion stance. On issues where Catholics are free to differ, bishops routinely denounce legislation that does not comport with their own political agenda. However, like Bishop Blaire, they often employ moral language and avoid rational analysis of legislative particulars. Instead, they adopt as an axiom the assumption that any diminution of federal welfare spending must simply be dismissed as immoral. However, the "missing middle" in their drumbeat masquerading as a syllogism is the assertion that all federal welfare programs designed to help the poor actually do help them — better than any other means of spending the money (such as private, voluntary charity, for instance, or other options). Bishop Blaire has repeatedly declined to comment on this to the Rubble, but was once pinned down by the very able Joan Desmond, in an interview with the National Catholic Register. "Rep. Ryan has asserted that he applied principles of Catholic social doctrine in the development of his proposal, but your public response stated that the proposal was 'unjust.' Were the principles poorly understood or poorly applied?" "I don't have his budget in front of me," he replied. Finally cornered, after repeatedly condemning Rep. Ryan's budget on moral grounds in the name of the Catholic Church, Bp. Blaire grants an interview and then simply refuses to answer the question. One wonders: is this only clericalism, or is it also cowardice? Bishop Blaire has refused to acknowledge Rep. Ryan's rights as a layman as articulated in the Dogmatic Constitution On The Church (Lumen Gentium), but other bishops have been more forthcoming. The Rubble wrote Bishop Howard Hubbard of Albany, a chairman of another USCCB Committee, asking if a Catholic could disagree with his advocacy of a certain piece of foreign aid legislation. Vatican II sounded a trumpet call for the "Age of the Laity" – yet the bishops and their bureaucracies have continued to drown out the voice of the laity in precisely those areas where the laity have professional experience and expertise, and the bishops do not. Bishop Hubbard cordially replied that "of course, it is possible for people of good will to disagree over how precisely to protect the rights and welfare of poor and vulnerable people, but the obligation to do so is without question." Cardinal Dolan has also confirmed Rep. Ryan's right to disagree with Bishop Blaire on budget particulars. "Why will you not support, or at least affirm, the rights of Catholic laymen in your own diocese — rights articulated in the Vatican II document Lumen Gentium — also known as the Dogmatic Constitution on the Church?" Once more, the bishop's spokesman affirmed that "[Bp. Nickless] does not want to have any comment." 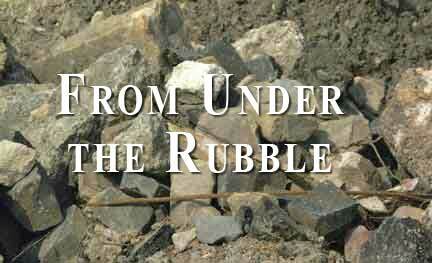 Well, the Rubble does have one. "Your Excellency: Tear Down This Stone Wall!"